Call us toll free at 1-800-638-5484 we are ready to help answer any questions that you have and place your order today. Blade flags from The Flag Company are second to none! We use the highest quailty material to ensure that your message always looks great! 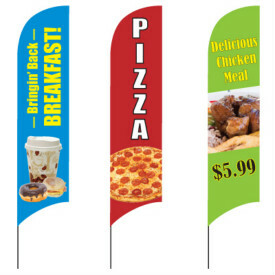 Blade flags can be used inside or outside, and our wide range of color choices and digital printing capabilities allow for endless designs!